For therapy assistant Megan Power, running on behalf of Team Mission United breathes new life into a longtime dream. When a patient came into her office and mentioned that Team Mission United needed three more runners, Megan’s name was quickly tossed into the ring. The Holtsville resident’s running experience dates back to her days on the high school track team. Starting as a sprinter, she eventually took to running distance after one meet left her running the 800m. From there, she went on to join the track team in college, and eventually, the cross-country team as well. 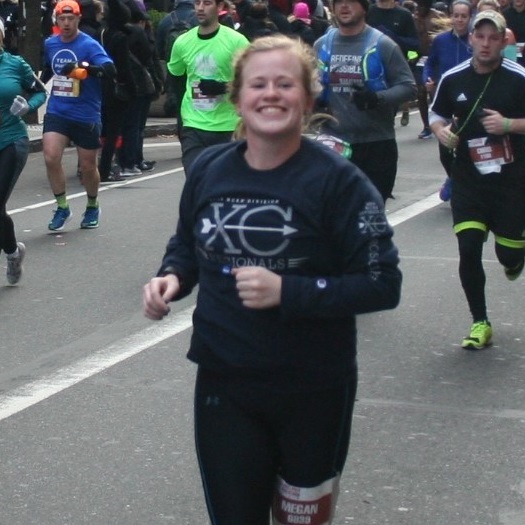 While in high school, Megan participated in the Sayville Summer Series, and since then has run in the Suffolk half-marathon and the Philadelphia Marathon. With so much experience stemming from her high school years, it comes as no surprise that Megan thought to invite two longtime friends, Samantha and Gina, to join Team Mission United along with her. While no small task, completing the race stands as a challenge the group ready to face. “Sam and I have always had a dream of running a marathon,” Megan shared. Running with Team Mission gives the group a chance to knock this goal off their bucket list in grand style at the TCS NYC Marathon, one of the world’s biggest and most popular marathons. Megan recalled that training together has been a true testament to their friendship: “With training, we are now all so much closer. Having my friends train with me means the world to me; I could never do it without them. We have so much fun together and I’m so happy to have them with me.” For these three friends, running for Team Mission United offers the opportunity of a lifetime to bond not only through their endurance but also through their commitment to making a difference. The marathon presents the chance for Megan to contribute to an important cause that has captured her attention. As her cousin is a U.S. Marine Veteran, Megan wholeheartedly supports Mission United’s dedication to providing support for veterans and their families. “When I’m fundraising and talking to people, they don’t realize how pervasive the problems that veterans face are,” she said. “I want to raise awareness about how many veterans on Long Island need help.” For these reasons, Megan proudly commits herself to Team Mission United. Offering services such as case coordination, emergency financial aid and career training, United Way’s Mission United works to provide possible solutions for the problems facing veterans and their families. These services assist some of the more than 100,000 veterans residing on Long Island. Motivated by longtime dreams and dedication to such a prominent cause, Megan has every intention of putting her training to good use and crossing that finish line come November.